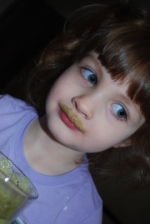 My kids and I are crazy about green smoothies. We make them a couple times daily usually. Never before has it been so easy to get my kids to eat plenty of those all important leafy greens! Just check out my daughter’s green smoothie moustache (left). To make a green smoothie you should start off by buying a good blender if you don’t already have one. I recommend a Vita-Mix or a Blendtec. I have used both to make my green smoothies and the whole process takes less than 2 minutes when you have a really good blender. Next, add about two cups of greens. My favorites are spinach and Kale but you can use any. You can even use carrot tops and beet tops. Then add some fresh or frozen fruit like strawberries, blueberries, banana, peaches, mango, pineapple, apples, pears, or melon. There are so many flavor combinations you will never be uninspired. If you used fresh fruit you may want to add a handful of ice cubes and then add 1-2 cups of filtered water. Blend and enjoy! I also give my smoothie concoctions cute names for my kids benefit like Dragon’s Elixr and Popeye’s Favorite. It makes it easy for them to tell me what they want. This spring and summer see how much of your green smoothie ingredients you can grow yourself and drink up! I’d love to try these, as we used the Odwalla green smoothie “SuperFood” concoction in our “Dare to Compare: Gross Out Game for Good Nutrition” at Shaping Youth…(the kids loved it) Wondering how this compares in terms of Vit/antioxidants/cals/nutrients/taste, etc? Sure would be cheaper I’d think! 🙂 Here’s more of the green scene we used for counter-marketing to kids, called “Using Shrek Against His Drek: Getting Kids To Eat Green” http://blog.shapingyouth.org/?p=475 Thanks, Tiffany, great post! 🙂 –Amy J.
I got a Blendtec for Christmas, and ever since I’ve been making green smoothies almost every day!! My 3 year old twin boys love them, but I can’t seem to get my 4 year old daughter to even try them!! Hopefully, someday she will give it a try. A favorite around here is spinach, frozen strawberries, bananas, apples and oranges. When my bananas start to get ripe, I peel them and put them in the freezer just for this purpose. YUMMY! !